Almost every person who plans on dieting or at least eating healthier is faced with one very common slippery slope – good food can cost more money. Whether you’re looking to invigorate your meal plan with organic products for a healthier system or just add more variety of fruits, vegetables, and appetite suppressants like almonds and nuts, your grocery bill each week could be a little higher…until now. 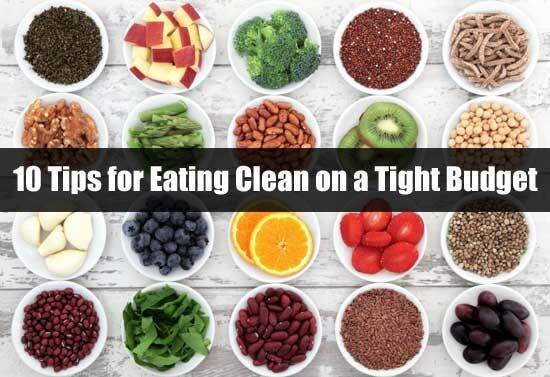 I’m one of those people who knows that you CAN eat clean on the cheap. Follow these 10 tips to reverse the trend that your wallet is the only thing getting thin while dieting. Check out our Ebook “Clean Eating for Weight Loss and Wellness” and our Free 4 Week Meal Plan to learn all about eating clean. Another tip that goes along with using your coupons is purchasing in bulk. There are certain foods like nuts (appetite suppressants), protein or breakfast bars, yogurt, chicken breasts and soups (good for cleansing) that are relatively expensive when purchased alone but provide great deals when bought in bulk. Look for foods that store and preserve well so having them spoil and go bad isn’t an issue. Beans, whole wheat pasta, tuna and brown rice are just a few examples of staple foods that you may use a lot in you weekly eating that you can buy in bulk to save money. There’s nothing worse than spending a boat load of money on fruits, vegetables and whole-grain bread only to have the bananas turn pitch black and the loaf sprouting legs and walking off before you can even enjoy it. Eating well on a budget requires managing of your food so that it gets used up in due time. Plan your weekly meals and make a shopping list to make sure that you aren’t buying food you won’t use. Also, don’t be afraid to freeze fruits and veggies so that they last. Using up your food before it spoils involves planning your meals. This tip has a two-fold method of making sure the food gets used but also possibly getting two meals out of one. For example you can make a whole pile of braised chicken on night 1 and then use the leftovers to make a gumbo on night 2 or 3. You cook once and eat twice without tiring of the taste. If you fail to plan, you plan to fail. If you plan healthy meals that will help you lose weight, the fast food and highly processed foods you need to avoid are less likely to be on your plate. It’s important to avoid impulse buys by making a shopping list for every trip to the supermarket. Along those same lines you should try to avoid multiple trips to the store in a week and make one focused trip to stick to your budget. Many times meal creativity for the week can come healthy recipe websites and online articles that focus on eating on the cheap. Search the internet an on Pinterest for great recipes. Many consumers would love to eat organic food at every meal but unfortunately that’s not realistic for everyone due to cost. That being said stocking your kitchen with organic foods is very much possible. Buy organic produce when it is in season. You can also freeze it and take advantage of meat and dairy sales. Another thing to remember is that meat and eggs should have high organic priority but items like cauliflower or sweet potatoes might be better served buying conventional because of low pesticide risks. Do your research to learn more about WHY buying organic is better and you can prioritize what you want to buy organic and what you can buy conventionally grown. Learning how to cook at home is also another way to frugally eat clean while at the same time learning a new skill. When you cook your own meals your portions can be larger with more leftovers for a free second meal and you’ll know everything going into your food. The main benefit of cooking is that you KNOW what is in your food and you have more control over the nutrients and calories. Save money by eating out less and learn how to make your favorite restaurant meals in a healthy way at home. It’s good to enjoy a night out with somebody else doing the cooking for you every now and then but that $40 + bill can really put a dent in your healthy eating budget. Even things like buying your lunch at work can add up over time to impact your pocket book. If you limit you dining out frequencies to a minimum you’ll be able to eat better and more diverse throughout the week. The more often you can get away with a brown rice, whole wheat pasta or bean based dinner for cents on the dollar, the more money you’ll have for buying organic and purchasing more fruits and vegetables. If you can integrate cheap staple foods like pasta, frozen veggies like cabbage or broccoli, oatmeal, potatoes, and more into your menu you’ll save immensely and still eat healthy. There are a number of things that can derail your healthy eating plan from lacking energy to disdain for changing your eating habits, but by following our tips a budget burden hopefully won’t be one of them. In addition to your article, another way to save on healthy food is to check out some apps on your smartphone, iPod, or computer. I use an app called Checkout 51 which features offers every week beginning on Thursday and ending on Wednesday. A couple of offers on there are for fruits and vegetables. Basically the app gives you cash back if you buy something that is listed as an offer. For example, this week there is an offer on there for 25 cents back on tomatoes. You do not have to buy multiple tomatoes, you can just buy one and at ANY Store! I have actually gotten a tomato for 13 cents one time! Basically what you do is you go a store and purchase the item, then take a picture of the receipt, and submit it to Checkout 51. And the one thing about this app is that you can submit from a smartphone, iPod, or a computer. So I guess the only catch is that you do have to wait for your balance on Checkout 51 to go up to $20.00 before you can cash out but with their offers, you can get up to $20 fast. After you have reached your $20 minimum you can either keep building the balance or you can cash out, which basically they just send you a check. I know it almost sounds too good to be true but I have been using it for months and it is absolutely amazing especially since I am on a budget for everything! WOW! Great information! I will definitely download the app. Thank you! I buy/cook seasonal. That way I can each cheaper because if the abundance of that fruit/veggie at that time of year. This helps improve your cooking skills and opens your taste buds/nose to a world of flavor. Additionally, I plan meals and buy appropriately. Sometimes I’ll impromptu if I see something on sale. I look up a recipe in the store and 9 times out of 10 we have the things we need because we cook at home a lot.